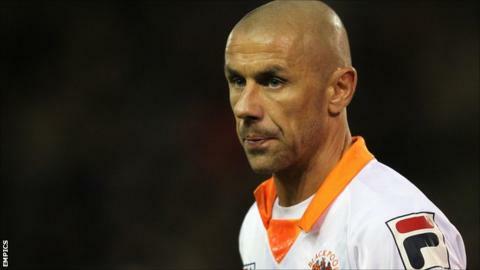 Blackpool striker Kevin Phillips has said he will retire from football at the end of next season. Phillips, 38, activated a clause in his contract to remain at Bloomfield Road for a further year and announced his decision at the end-of-season awards. He scored 17 goals for the Tangerines, who missed out on promotion to the Premier League on Saturday, in 2011-12. Daniel Bogdanovic, Matt Hill and Stephen Husband are all set to leave Blackpool this summer. Phillips, who has scored more than 250 career goals and won eight England caps, is one of 13 players that have had the options taken up on their current deals. Keith Southern, Neal Eardley, Alex Baptiste and Gary Taylor-Fletcher will remain at Bloomfield Road, as will Elliot Grandin, who has completed his loan spell with French club Nice. New contracts have been offered to Lomana Lua-Lua, Roman Bednar and youngster Louis Almond, although Lua-Lua is expected to reject the proposal. And experienced striker Brett Ormerod will also be offered fresh terms, despite officially being released by the Championship club. "The club haven't taken up his option, but (manager) Ian Holloway said he wanted to keep Brett in some guise for next year," Blackpool secretary Matt Williams explained to BBC Radio Lancashire. "You have to get your retained list in by the third Saturday in May. We were given a little extra grace because of our play-off commitments. "Technically, as no offer has been formally made to Brett, the paperwork we submit to the Football League [says] that he's been released. "An offer will be made to him, but to comply with the regulation for the retained list, it had to go down that he'd been released. "Brett's fully aware of the situation, he's finally got his head around it and he's looking forward to sitting down with the chairman to try and sort something out for next year."